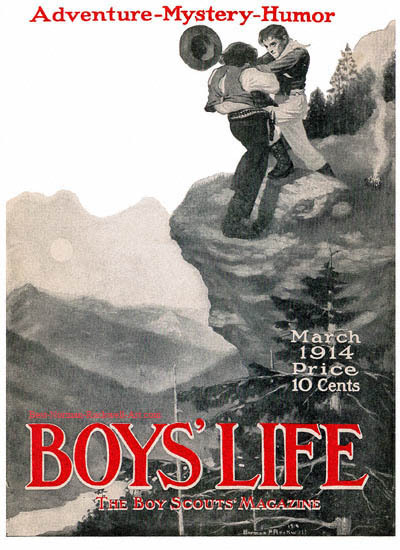 Fight on a Cliff, this Norman Rockwell painting, appeared on the cover of Boys' Life published March 1914. This event marked Rockwell's seventh cover publication. This month Rockwell treats us to an action scene. After the previous two months of winter scenes (Brrr), we receive a change of pace with this fight scene. Here wee see two cowboys fighting at the edge of a cliff. We do not know who is the good guy or bad guy. We do not know where or why the fight started. The fight has progressed dangerously close to the edge of the cliff. One of the combatants is only one step backward from being in the valley below. His hat is already on its way over the edge, having been knocked off his head. His pistol is still holstered. He has no free hand to draw it. Norman Rockwell painted the scenery in the background to convey how big a drop such a fall would be. The river in the valley looks very far below.